Merry Christmas in July! This is my fourth annual Christmas in July post, and it's one I look forward to every year. When I wrote the meat of this post last night (I work tonight and there's no way it was going to get done when I come home) I was listening to The Cloisters' Little Winter. If you want the full experience from reading this, I suggest you throw that on your speakers. This year's Summer Xmas post come's all the way from Belgium's Brouwerij (or, Brewery) Corsendonk: Corsendonk Christmas Ale. When I saw it at my local bottle shop the other week, I knew I had to get it for this post. I have another beer that I initially wanted to write about for this, but I think it can age another year. Unfortunately, I'm unable to find an official web presence for Corsendonk. But, like most things in existence, there is a Wikipedia article about the Belgian brewery. According to this, Corsendonk was originally a priory (and, presumably, brewery) that operated in Oud-Turnhout for nearly 400 years. In 1982 Corsendonk as we know it began, serving as a vehicle to produce abbey style ales. 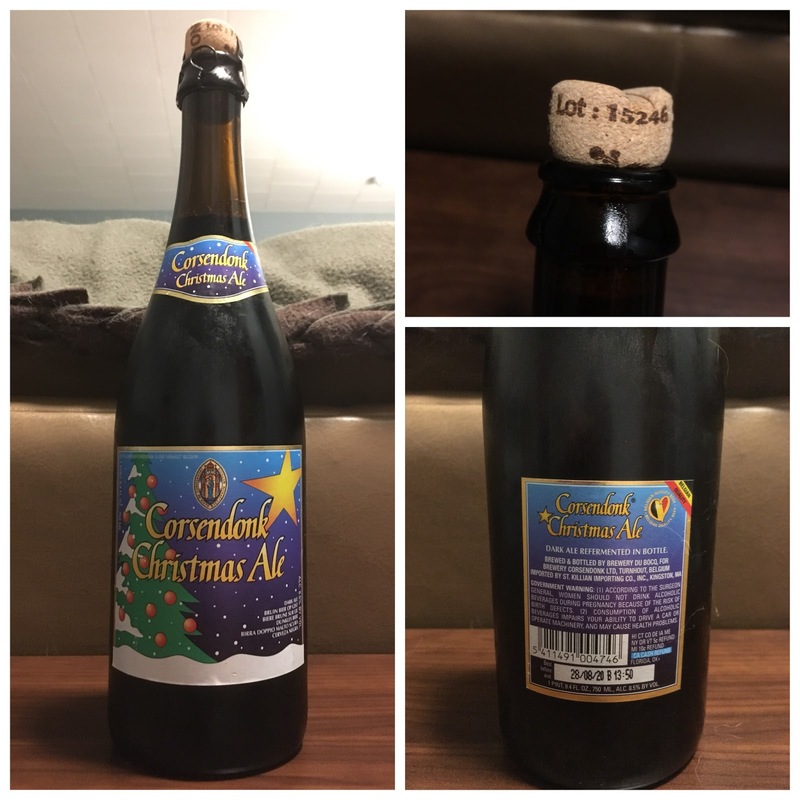 Corsendonk's beers are actually produced by Brasserie du Bocq (Brewery du Boco on my bottle), another Belgian brewing company, and I see on the back of the bottle on my table that they're the folks behind Corsendonk Christmas Ale. St. Killian Importing, the good people responsible for bringing Corsendonk to the US, has this page devoted to the beer it imports from the brewery. You'll find Christmas Ale at the bottom. The write-up here call the ale malty, spicy, citrusy, and smoky, with a finish that's tart and malty. The aroma features chocolate and spice and the mouthfeel is creamy. My bottle informs me that the ale boasts an 8.5% ABV. The bouquet is a little tough to nail down. Of course I get the chocolate and (a light amount) of spice. I also find notes of orange dancing around here. There's a lot of sweetness that you typically find in darker Belgian-inspired beers. But there's an element that's a little more challenging for me to put my finger on. The beer's aroma has an almost champaign quality to it, but that's not quite the word I'm seeking. Regardless, it's definitely not what my American nose would define as a Christmas Ale, but it's still fantastic. Purrl gave my bottle fifteen whiffs, which is high praise from her (I'll note here that she also liked smelling the bottle's cork, which had a slightly different aroma). I get a ton of flavors from the ale. Chocolate, orange, dark fruits, honey, caramel, and mild spice (think cinnamon, but not quite). There's a swell of toffee in the finish before it drys out just a smidgen. Strangely enough, I don't get any of the smokiness St. Killian touted. As with the bouquet, I wouldn't necessarily peg the sum of all this various aspects as "Christmas," but I can definitely see how easily the ale could be enjoyed before the fire after putting this kids to bed on Christmas Eve. The mouthfeel is more than creamy. It's velvety. It's luscious. It's the feeling you get when you pull your warmest fleece blanket all the way up to your chin on the coldest winter nights. Shortly after Michelle and I moved into our house the weather turned ridiculously cold and snow fell like gangbusters. One night we decided to break into one of the EZ-Light fire logs that came with the house and throw it in our buck stove. I lit it easily enough and we sat down in front of the fire with Pip, our dog, and warmed ourselves up. 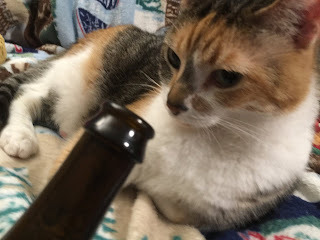 I had some dark beer I'd picked up from the supermarket earlier and we knotted together a no-sew blanket while the fire popped and crackled in front of us. It was wonderful. And, while it's not exactly a Christmas memory, it's Christmasy enough to be on my mind as I sit here drinking Corsendonk Christmas Ale. This is a tough beer to review. My Midwest palate is preventing me at every turn from recognizing it as a Christmas ale. Sure, I can readily envision it being a winter staple, but it doesn't have the spice I've come to expect from the style. However, I know that American beer isn't the same as European beer and that their styles vary from ours. As such, Corsendonk Christmas Ale gets a solid 8.5/10 from me. If you're looking for a little special something for tonight, this ought to do the trick.